Engine and transmission: 166 horsepower, 2.4-liter 4-cylinder with 4-speed automatic transmission or 269 horsepower, 3.5-liter V6 with 5-speed automatic transmission. Available with front-wheel or all-wheel drive. When the Rav4 was redesigned last year, it got longer and took on an optional third row of seats. 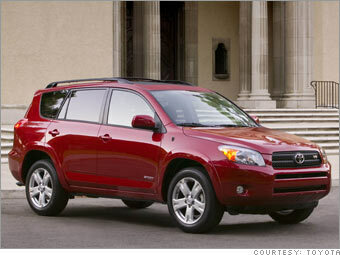 It also has excellent fuel economy for an SUV and decent performance even with the standard 4-cylinder engine. With the V6, the Rav4 borders on sporty. Its looks may not please everyone - to me, it always looks like it's melting - but it's hard to deny that the Rav4 is perhaps the most purely sensible choice in a small SUV.